Join me later this month at the spring Quilt Market in St. Louis, Missouri! I'll be giving a presentation (and giving away free magazines and there will be a draw for fabric) on Saturday, May 20 at 11am in the Windham Fabrics booth. On Sunday, May 21 starting at noon, you're invited to come back to the Windham Booth for a fun and easy craft: making necklaces and rings with my new collection UPPERCASE Volume 2: Dots, Dashes and Diamonds. Supplies and space are limited for the free jewellery-making session, so if you're going to be at Quilt Market, please RSVP here to reserve a spot. It's a fabric ring of POWER! If you're going to be showing at market or roaming around and would like to connect, please get in touch. 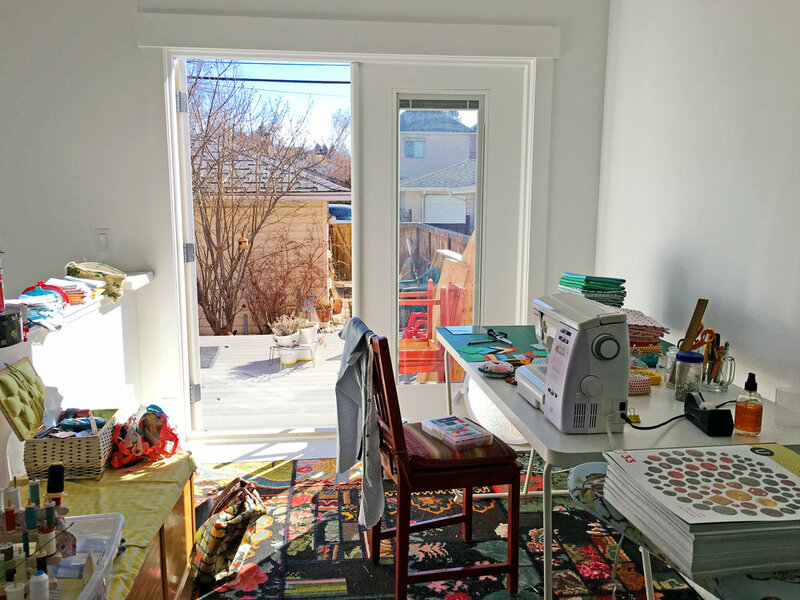 Now that the Look Book for UPPERCASE Volume 2 is published, I'm happy to share more pictures of my sewing room. Fiber drums purchased online from Uline.ca were the perfect solution for storing 32 bolts of fabric! They nestle in a narrow hallway—they're nice to pass by everyday. And here are the warm colours. They're basically the same palette as my first fabric collection, but this time there are more colours at play in many of the designs. This shelf used to be Finley's changing table. I've always wanted a family of calico cats. Thanks to Glen and Finley and their Christmas gift, I have these little guys to play with. I'd like to sew them clothing in my fabric and vintage feed sack scraps. So cute. They appeal to my 8-year-old self. Vintage thread spools. They appeal to my 40-something-year-old self. Here's an overview of the sewing area. It's at the base of the stairs and opens out to the deck. The neat areas are on the perimeter since I was taking pictures for the Look Book—everything else was piled up in the middle! There's nice natural light to sew and photograph by. I look forward to sharing more behind-the-scenes photos and details of the projects I made. Safe to say, if you see nicely cropped images from me, there's a lot of STUFF that I've omitted from the shot! It's pretty incredible to have a first fabric collection, let alone Volume 2! Thank you, Windham Fabrics! 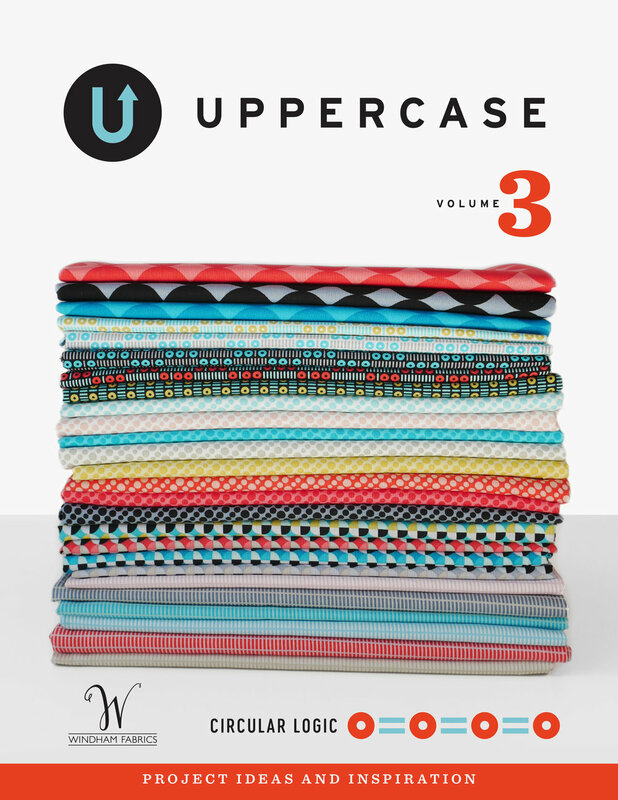 I'm pleased to present my forthcoming collection with Windham Fabrics, UPPERCASE Volume 2: Dots, Dashes and Diamonds. The collection is on sale now as preorders for fabric retailers—visit the Windham Fabrics website for more details and to place your wholesale order. It will be available in stores in November. Peruse the Look Book here and find out more about the UPPERCASE (Paper) Quilt Block Challenge. Thanks to my son for helping me with this post! It'll be some time before the my new Windham Collection is available in stores (November 2017) but that doesn't mean we can't have some fun with it! Let's get our creative juices flowing... by playing with paper! 2) Design an original or traditional quilt block or use the patterns to create a collage. (Print out multiple copies if you need more of a particular pattern.) You can add solid white or black if you like. The finished designs should be square. 3) Take a square photo of your creation and share on Instagram with the hashtag #uppercaseblock. The creations will be displayed in an online gallery. See more of the UPPERCASE Volume 2: Dots, Dashes and Diamonds collection over here. Textile and mixed media artist Frieda Oxenham has made these beautiful flowers and quilt using the UPPERCASE collection from Windham Fabrics. Stunning! Surface Pattern Design Guide and Competition deadline extended! 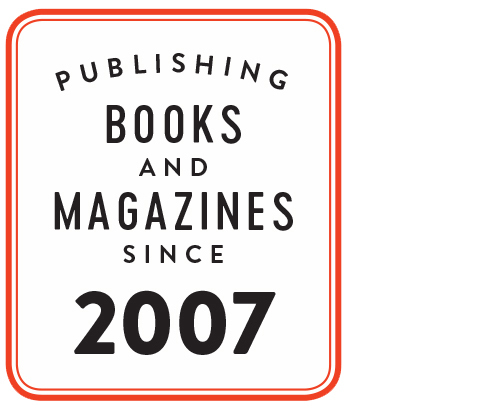 Ever dream of being published in UPPERCASE? 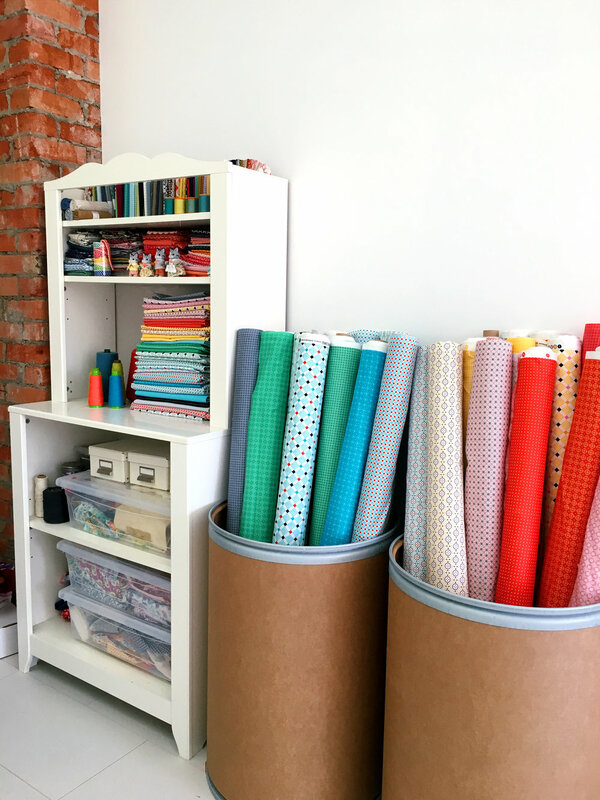 Or of having your own fabric collection? Submit your work! Deadline extended to September 12. Heather Givans is the energetic force behind Crimson Tate. 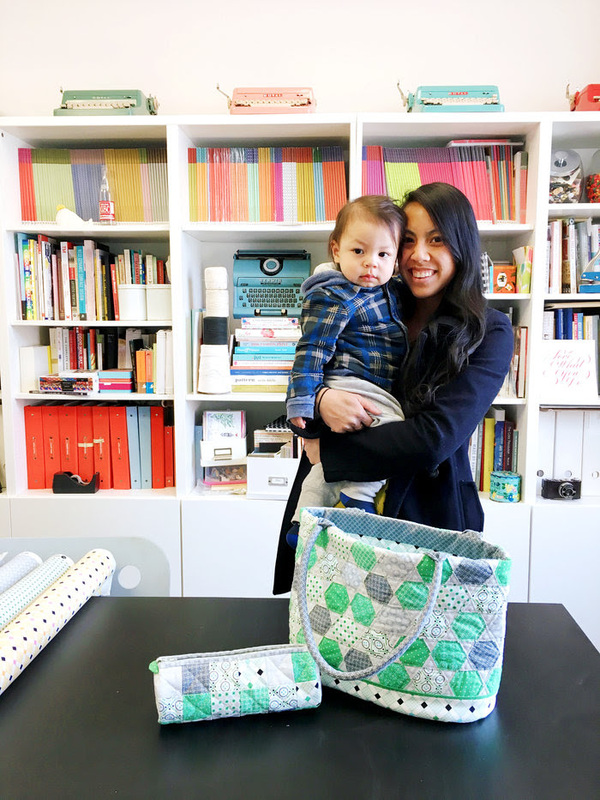 She's a quilt-shop owner in Indianapolis, fabric designer, quilt designer and maker. She's a fellow designer with Windham Fabrics, but I hadn't yet met Heather when I saw that she had tagged me in a somewhat strange Instagram picture a few days before this year's QuiltCon. Once I met Heather in person, I realized that my fears of some bizarre internet stalking were unfounded. Turns out that the ransom-note style cutouts of faces were a fun little prop — during QuiltCon she put different pictures of fabric designers and quilters in one of the open pockets in her Letters from Home quilt displayed in the Crimson Tate booth and made with the UPPERCASE collection with Windham Fabrics. Above is the Letters from Home quilt in Heather's collection. Heather writes, "Nothing is sweeter than a handwritten letter. The act of opening an ornately lined envelope only to find kind words from your grandma, mother, or friend is a treasure not soon forgotten. Create an heirloom quilt to mark milestones such as weddings and graduations, to honor those serving in the military, or to remember any special life event. A modern take on the signature quilt, Letters from Home is the ultimate love letter." Her Look Book is really nice (I looked at it when I was working on my own, thanks for the inspiration, Heather!) The paper airplane motifs and quilts are clever, too. 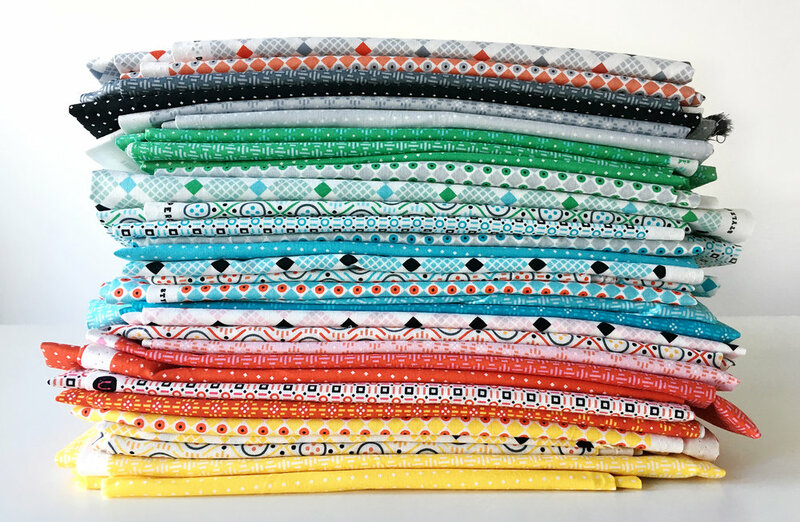 Windham Fabrics is giving away a bundle of Paper Obsessed fat quarters on every stop of the Paper Obsessed blog tour! Heather is also including a pattern called the Correspondence Mini Quilt plus some Paper Obsessed swag. 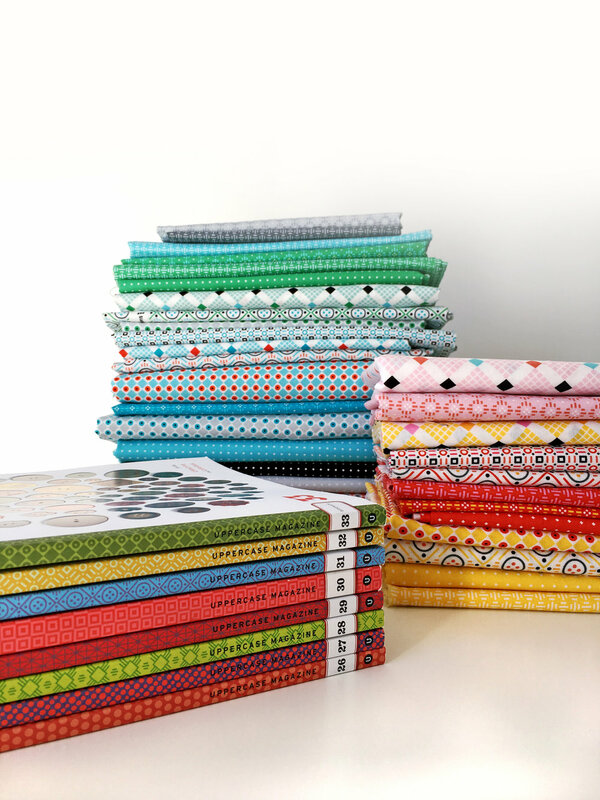 Leave a comment below about how your paper and sewing obsessions combine. Make sure to include a link so that we can contact you. Comments close noon MT, July 25. My life has been a blur since coming home from Quilt Market — I've been in full-on design mode and proofing mode to get issue 30 done. Which it is. Except for the whole printing, logistics and shipping part! 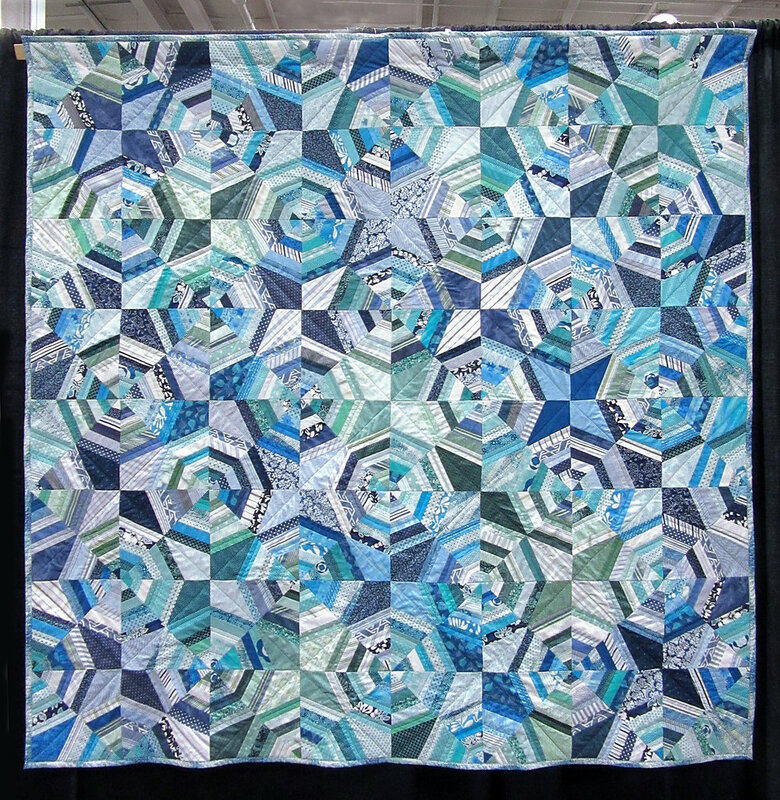 I met some nice and talented people at Quilt Market. I gave away some charm squares and there were also fat quarter bundles for sale, so now I'm starting to see what people are making. Fun! I enjoyed seeing Laura Estes' sweet fabric flowers and I gave her a charm pack to play with. "The Jumbo Coin Ruching Guide, TR700, designed by me and produced by Quilting Creations International is an acrylic tool used to mark 5 inch and 2 1/2 inch strips of fabric with a scallop line to stitch and draw up the fabric to form petals," she writes. "With the 5-inch charm squares, one scallop is marked on each of 19 or 20 squares, and as each petal is stitched and drawn up, they are joined together then formed into an approximately 6 inch bloom. The process is easy and fun for all skill levels, and there are some tutorials on my blog." Inspired by an old apron with ample pockets found at a flea market, this modern take can hold your phone, cash and more. I call this my Craft Fair Apron since it would be handy if you're selling at a fair and need everything at hand. The original apron was basically a strip of fabric with a fancy printed pocket sewn on. The ties are threaded through a sleeve along the top so you can were the apron gathered or pull it around for a more sleek effect. For my interpretation, I used strips of different fabric to mimic the pocket motif. I didn't want to line the pockets, but I also wanted them to be nicely finished since I'll be reaching in there for my phone and notebooks frequently. So with half-inch seam allowances, I ironed the extra in half and folded neatly under. Then top stitched. I like how it turned out. Maybe I'll just where it around Quilt Market to carry business cards and pins! I call this quilt "Halfsies" since it started as a simple sketch on my computer with each square being reduced by 50% and so on. The pattern is available on the Windham website. 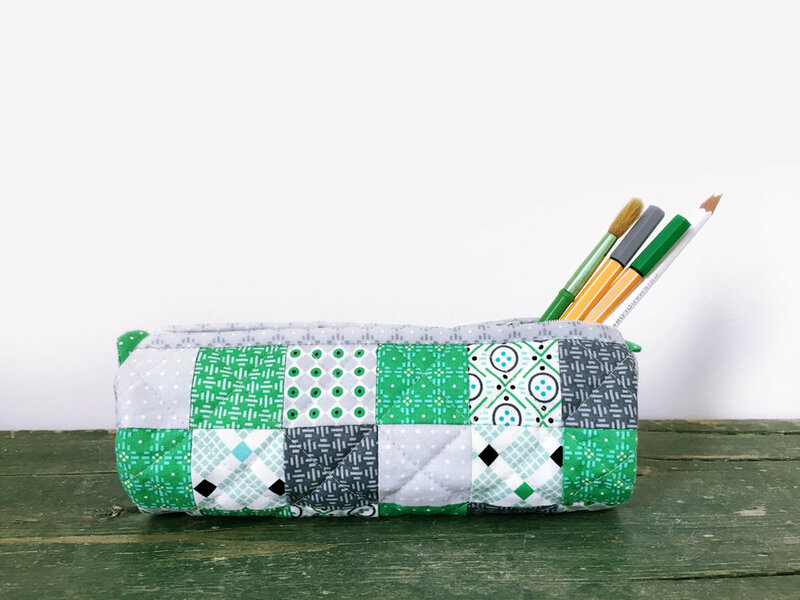 Here’s an idea come full circle: a quilt design inspired by the spines of UPPERCASE magazine—the thing that inspired this very fabric collection in the first place! My son was my willing model for the Look Book—he even art-directed some photos. The quilt was sewn by Heidi Pridemore of The Whimsical Workshop for the Look Book. Free pattern available at windhamfabrics.com. This design is fat quarter friendly. One of the challenges in making the Look Book for my fabric collection was designing the quilts that were going to be made! I'm not a quilter (yet!) but I'm a quilter-in-spirit! Fortunately, my mom is an amazing quilter (and quick, too) so she was enlisted to help make this quilt design that I call "Here and There Squares". I wanted to design a quilt that would include all of the fabric options in one quilt, with the exception of the two silver metallics, so I started to play around with contrasting the colours with the grey tones. It’s fun to play with lights and darks, warms and cools. In this quilt design, squares pop and recede and play tricks with your eyes. This is a massive 96-inch square quilt. It was sewn and quilted by Bonnie Vangool. Free pattern available at windhamfabrics.com. Put this quick project on your bucket (hat) list. This is the simple reversible bucket hat, a free downloadable pattern from Oliver + S. Finley is a big fan of the colour red, so he chose the red and pink floral as one of the fabrics, the red chevron on the inside. There are lots of great two-colour combos available in my UPPERCASE fabric collection. I've never made a hat, but Liesl Gibson's instructions are simple to follow and that hat was easy to put together. I made the largest size, but it is a little on the snug size, so I'll have to scale it up to make another... for me! Progress photos by me, finished project photo by Kirstie Tweed. So anyone who knows me (or UPPERCASE) knows my fondness for typewriters. I call them the UPPERCASE mascots. So it was natural that I come up with some sort of typewriter and fabric project! In fact, there's already a connection. If you look at the colours of my Royal Quiet DeLuxes and my fabric collection, they share a similar colour palette. I decided to make a dust cover for a typewriter. You could quite easily adapt this process to make a cover for your sewing machine. Please keep in mind that I'm not a DIY blogger or writer of craft instructions (nor do I plan on becoming either—I've got way too much to do already!) When it comes to sewing and making crafts, my usual process is to look at a lot of similar projects and read their instructions. Then I put that all aside, head over to my own project and available materials... and wing it! Knowing that my fabric projects would be shared online, I took photos along the way. Keep in mind that I was figuring it out as I went along. And when things got complicated I sometimes forgot to take photos since I was concentrating or busy being frustrated. Here's my rudimentary sketch of what I planned to make. Two sides with interfacing to make them sturdy, and, in a contrasting colour, piping to define the edges. I selecting my fabric to coordinate with my favourite turquoise Royal. I had already made bias tape for a previous project and decided to use the extra to cover the piping. I put some kraft paper on my table and loosely traced the typewriter on its side, leaving generous amount of room for the keys and knobs. Next, I refined the curves and overall shape and added some extra allowance so that cover wouldn't be too snug. I cut my template and then two pieces out of fusible, fairly stiff interfacing. I used the outline to determine the length of piping I'd need. Using a basting stitch, I covered the piping with my bias tape. I cut the shape out of the fabric half an inch around the interfacing plus an inch or two extra at the base. I measured the desired width of fabric needed to cover the machine. For its length, I used the piping as a guide for how much would be required. In both cases, I added some generous amounts on either end to allow for hems and just in case. (Remember, I was making this up as I went along!) I also fused more interfacing to the front panel to give it some shape. Once the sides were both attached, I put the cover on the machine and folded up the hem as required and stitched it. With some steaming and ironing, the cover turned out ok. It looked a little plain, so I decided to dress it up a bit. I've had this plastic turquoise buckle for some time, so it seemed of the right era to suit a typewriter cover. And with the bow... voila! If I were to make another cover (I've got a dozen typewriters! ), I might omit the piping and just make a fabric flange or something a little simpler—but I do like that contrasting pop of colour! The top two photos and finished project photos are by Kirstie Tweed of Orange Girl for the UPPERCASE collection Look Book. Process photos taken with my iPhone.